Sticking to a diet which includes fruit, vegetables, fibre and healthier fats could protect against type two diabetes, a study suggests. More than 14,000 Spanish volunteers were quizzed about eating habits, then checked over four years to see who developed the condition. The results pointed to an 83% lower risk for those who followed the diet, the British Medical Journal reported. But UK experts said the study was not conclusive. People living in Crete, southern Italy and Greece provided the inspiration for the so-called Mediterranean diet. Their traditional lifestyle involved not only regular exercise, but also plenty of fish, fruit and vegetables, usually cooked in olive oil, and washed down with the occasional glass of red wine. Studies have suggested that modern diets based on this ideal could improve heart health. The idea that it could also reduce the risk of diabetes is a logical step - olive oil is already known to improve blood sugar control and lower blood pressure. The 14,000 men and women, of varying ages, were all scored on their own recollection of which elements of the Mediterranean diet they followed in day-to-day life, and split into three groups, depending on the level of their adherence to the diet. As well as gaining a point for eating key ingredients fish, fruit and olive oil, they got one for cutting back on animal fats and keeping to a moderate alcohol intake. The highest group had managed seven or more points, while the bottom group had less than three points. The researchers then waited to see who developed diabetes over the next four years, and found that the average risk for those in the highest group was 83% lower than for those in the lowest group. Those in the middle had a 59% fall in the risk of diabetes. However, the average age of those taking part was around 40 years old - under the normal age for type II diabetes to strike, and the study authors conceded that the relatively low numbers of new cases of the condition over their four-year period made the results harder to rely on. They called for bigger and longer-term studies to test the diet. Dr Iain Frame from Diabetes UK said another weakness was the questionnaire format, which relied on volunteers' honesty and memory to give accurate results. 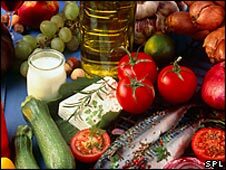 He said: "Although it is interesting that the researchers conclude that a Mediterranean diet could provide protection against Type II diabetes, more robust research is needed before we can draw any firm conclusions about this claim. "A fundamental link between being overweight and developing Type 2 diabetes has already been proven. "Diabetes UK advises people to follow a healthy diet low in fat, sugar and salt with plenty of fruit and vegetables, and to take regular physical activity to reduce the risk of developing the condition." A spokesman for the British Nutrition Foundation said that different elements of the diet could be making a difference. "Although these kinds of study don't allow us to pinpoint exactly which part or parts of the diet are having the beneficial effect, the fact that the Mediterranean diet is high in fruit and vegetables, fibre and unsaturated fat and low in saturated fat could all help to reduce the risk of diabetes. "Another element of the diet was high consumption of olive oil which may improve blood glucose control and reduce inflammation, both of which could help to prevent diabetes developing."